Our “wake up earlier” project works quite well. I’m sitting down and working before 7am each morning, although with everything I have on my plate it’s never early enough. Damn you, Sleep!! 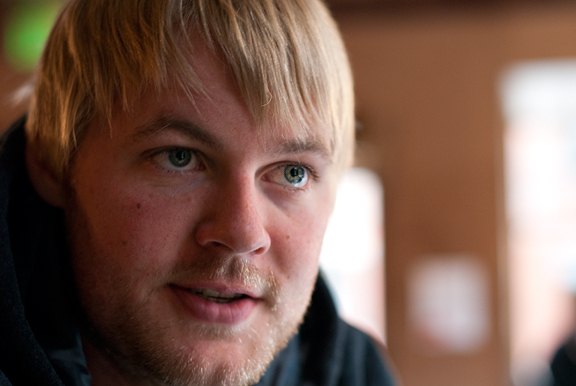 I was able to catch Andrew on Monday before he slipped off to Austin for SXSW. We went to Nick and Willy’s in Boulder for some slow-roasted chicken. That is some gooooood chicken. If you haven’t tried it, you really ought to. After that, we set to work on some items for the photography workshop. Whenever it feels like the organization and planning is bogging me down, I talk to Andrew and he gets me jazzed up again. Fan-freaking-tastic! 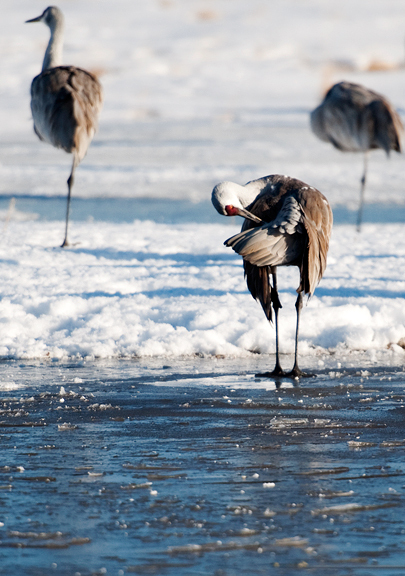 I finally culled my 2000+ photos from the Sandhill crane shoot (two words: marathon session) and have a few more to share before we move on to other fun and exciting things. I’m not posting all of them, that would be insanity… and boring. Sarah had asked in the comments how I go about choosing the keepers when I have culled out the technically inferior photographs (unfocused, bad compo, etc.). That’s an excellent question. I think part of what makes a good photographer is knowing what not to show and that requires having artistic standards. I remove my personal emotional attachment to captures and try to be as objective as possible. And I am a pretty hard critic of my own work (and of other people’s work, but I keep those thoughts to myself). I threw pottery for ten years. When I was first learning to throw, my instructor (an incredibly talented artist) pulled one of his beautiful bowls from the kiln. Stu scrunched his nose at it and threw it in the trash. “What are you doing? !” I exclaimed as I ran to retrieve it from the trash bin. He told me it wasn’t good enough, not up to his standards. “Well, it’s up to mine, I’ll take it – don’t throw it out, Stuuuuuu,” I pleaded. He shook his head, gently took the bowl from my hands, and smashed it on the ground. “If it has my name on it,” he smiled “then it has to be up to snuff.” I thought he was crazy then. I get it now. To answer Sarah’s question: I don’t delete good or great photos. I keep them in archive. The ones that I show – sometimes less than 1% or up to 10% – are the best ones of the bunch. If I have 5 photos of the exact same thing, then I’m doing something wrong, because that is not how I shoot. Usually I will have a series that varies the depth-of-field, exposure time, focal length, composition, or action. If all is technically solid, then choosing the best one boils down to my artistic judgment. I think a lot of photography enthusiasts overlook the importance of being selective. Loving your photograph is not going to make it any better or any more appealing to an objective viewer. About a month ago, I was breezing through the Boulder Whole Foods store when I stopped at the produce section where they harbor exotic things like prickly pears, passion fruits, and spiky round orange things. What caught my attention was a Buddha’s hand citron. I knew about these because I had seen Todd and Diane post about it on their blog. What I didn’t know was how the fragrance would mesmerize me into purchasing two of them without having the slightest clue what I would do with them. 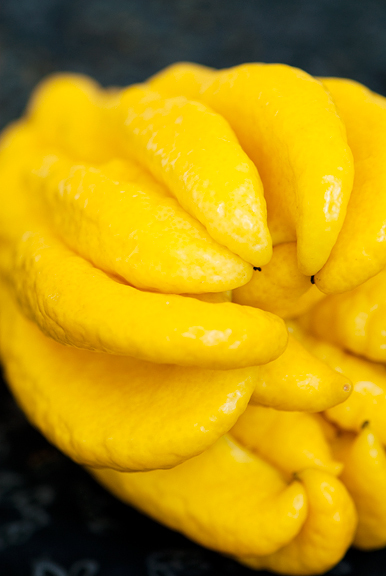 If you hold a Buddha’s hand citron to your nose and inhale, you will be transported to a world of lemons and roses. That’s the only way I can think to describe the fragrance. It is a floral and citrus perfume that wafts into your nostrils and you will inevitably close your eyes to be engulfed in the reverie of scenes from fabric softener commercials (you know, the rolling green hills, diffuse warm sunshine, furry bunnies, and sprouting spring flowers). I could have candied the peels, but having just candied a million orange peels, I was sort of over that whole thing. I went to Todd and Diane’s page and saw that they made Buddha’s hand citron vodka. I’m not much of a boozer, but this sounded like a fun excuse to buy large quantities of cheap vodka. The process is so simple. The biggest challenge was finding some bottles nice enough to give to friends. To say that Boulder has an enthusiastic home brewing community is an understatement. I was able to pick up a great set of bottles from Hop To It Brewing in Boulder. 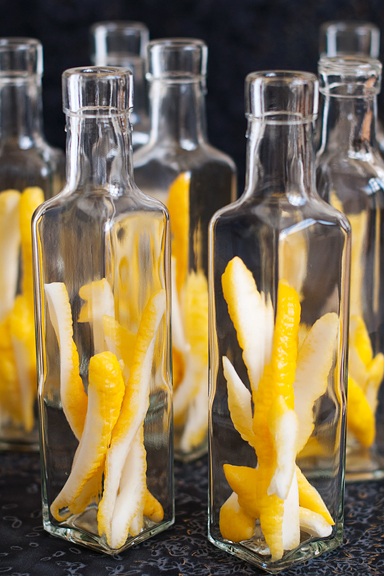 It has been a month since I bottled the citron vodka. I’ve kept them stored in a dark, cool closet and I think they are ready now. I have to look around for a good cocktail to try, but the bottles also make for great gifts. 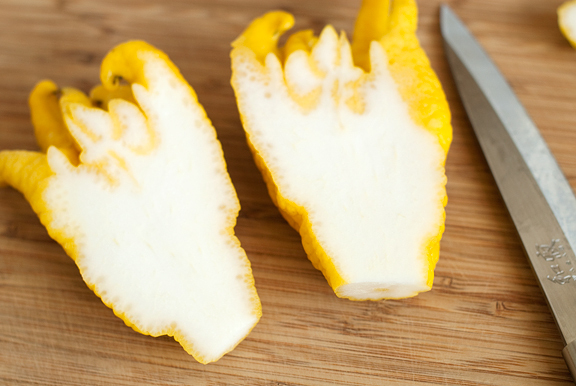 Wash the Buddha’s hand citron, pat dry, and slice in half. 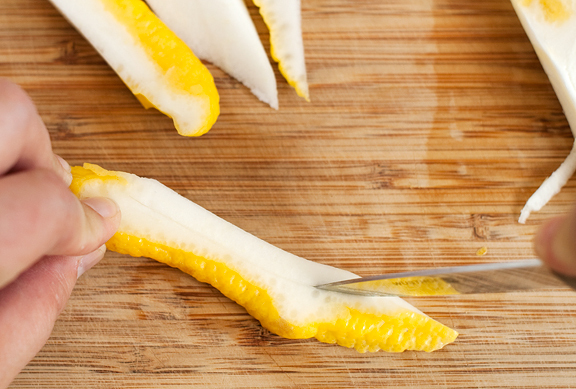 Cut the peel into strips and remove any excess pith (a little is okay). 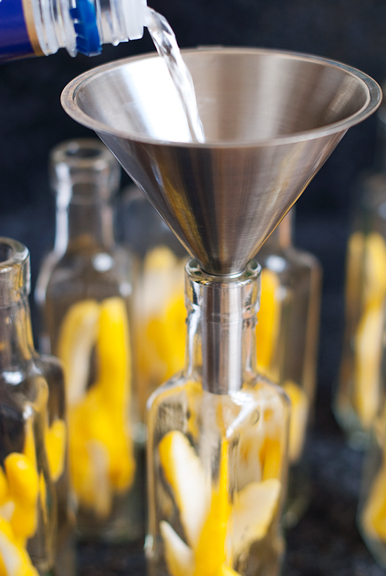 Divvy up the peel among your clean, dry bottles. Pour the vodka into the bottles. Cap and store in a cool, dark place for 30 days. 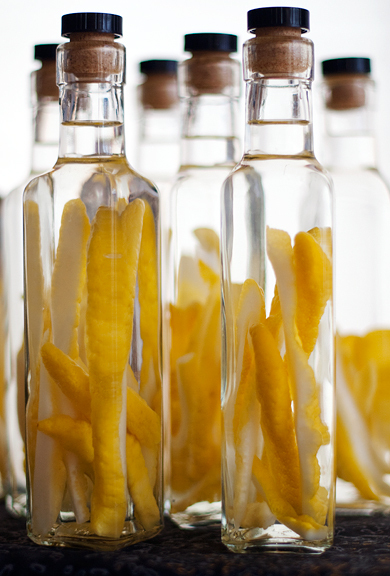 Your Buddha’s hand citron vodka should be ready! Lemon and roses is a perfect way to describe this odd looking produce. I loved the Buddha’s hands at Whole Foods! Except that I didn’t actually buy them and make something useful, I was just chased around the store with them by someone pretending they were creepy (but pretty) horror movie props. Jeepers, that Buddha’s Hand alarmed, enticed and partially freaked me out. Awesome way to sue it, there are some lucky recipients on your gift-giving list. What beautiful photos! 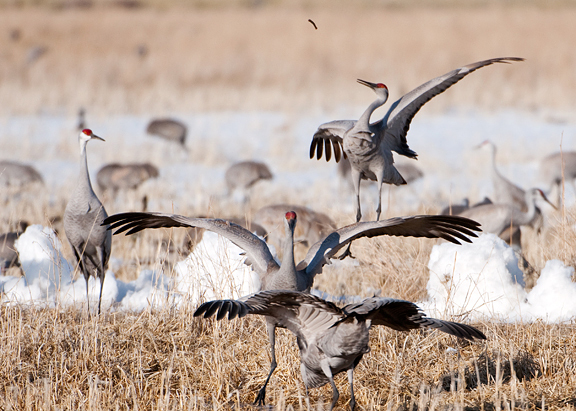 I’ve tried to photograph the sand hill cranes we have in our neck of the woods, but never have been able to get shots like these! Great recipe also. Christmas gift next year…. WOW! I’ve never seen Buddha’s hands! 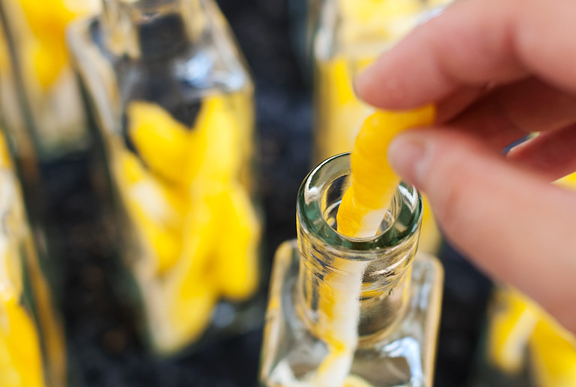 Can’t go wrong with homemade lemon vodka! The first photo of the sand dune is simply breathtaking. 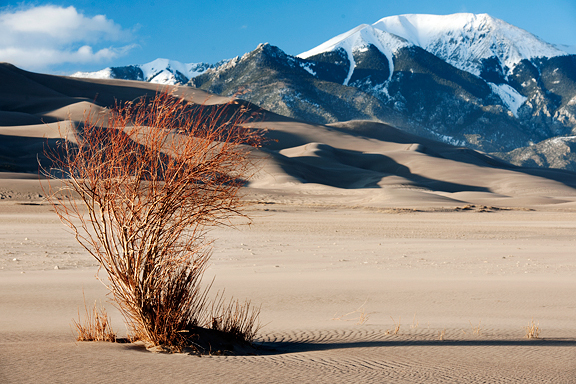 Love the juxtaposition of the mountains in the back and the rolling dunes in the foreground. What a great gift these would make….I’m sure the receiver will be thrilled. Your pictures are incredible! I am drooling! Lemon vodka–mmmmmm. AND some cool pictures of birds to go with it! Do you know how long they will last…..after the thirty days? Great idea! I’ve got a bottle of Hangar One buddha’s hand vodka in the cabinet and it’s excellent. I imagine it’s even better and fresher tasting when you make your own. This would make for a great gift! I really love the captions you give to your photos! Gives them more character! Thank you for sharing them. Visiting your blog is like taking an outdoor vacation! Thank you for the visual experiences, it’s breathtaking. And yay for all the buddhas hand vodka! Same some for us when we party it hard in CO soon! We’re very good at letting go of images. It improves our workflow and opens up hard drive space for different pictures! It looks beautiful. It almost makes me want to start drinking alcohol. Almost. haha. We’ll be on the look out for the Buddah’s Hand Citron. What a marvelous gift! We also loved your Christmas Crackers!! Great ideas! And, of course amazing photographs!! Wow… looks like you can do alot with vodka! I’m waiting for my vanilla beans to arrive and then I’ll split them open and stuff them in a bottle of vodka to make vanilla essence! Oh, and beautiful bottles btw! Those are such nice little bottles! Where would one get something like them? Buddha’s hand sounds so much nicer than the severed chicken feet I thought they looked like! Love the photos & your sharing. There are some things I need to train myself to be more objective about. 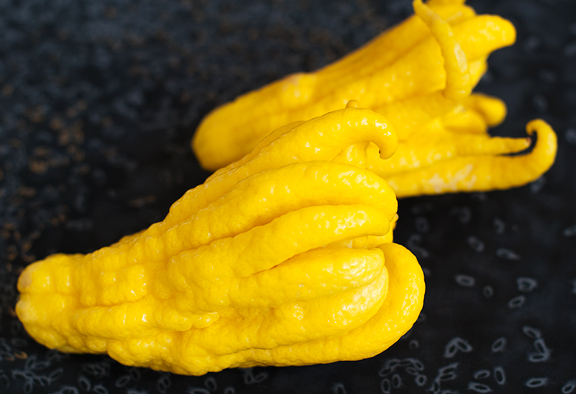 whoa ive never seen these buddha’s hand citron! will have to keep a look out next time i get to whole foods. 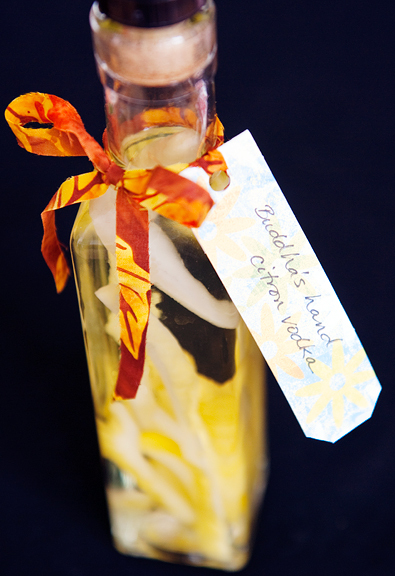 this is such a fabulous gift idea…im definitely going to have to make up some of this infused vodka to have around for summertime happy hours! Thanks for answering my question. I appreciate the time and thought you put into answering. I am slowly learning to have an “artistic” eye and not just “oh, I like that picture” eye. Thanks for sharing not only your breathtaking photos but all your knowledge in photography. Your shots are amazing! Truly a feast for the eyes, keep up the good work! Awesome idea. I might have to do this for Christmas! Sometimes when you love something enough, it becomes beautiful. Hehe. Just kidding. You can be hard on yourself, cos you actually *get* great pictures in your folio. I just saw Buddha’s Hand in the grocery yesterday and was marveling over how incredibly beautiful and wickedly mysterious they were! I wondered what in the world I would do with one…. and then I literally stumbled upon your post on tastespotting… now THAT’s Karma! I have sworn for 2 years that I am going to make Limoncello to give as Christmas gifts, but never start in time. I wonder how Budda’s hand would work for that. This looks great. We grow buddas hands and I found your blog when I looked for candied orange peel. We have candied the buddas hands too. Our tree is right out by the street and we have people ask about them all the time, even come up to the door and ask. They are quite an interesting thing. Many of ours are much larger than in your pictures. Up to a foot across with up to like 30 fingers. Thanks for the cool blog! What a good thing to make to give it out as gifts! You are always bursting with such brilliant ideas Jen! Kirsa – I’m not sure. I have never had citron vodka, just the Buddha’s hand citron vodka, so I couldn’t tell you. LoveFeast Table – thank you, you’re very sweet. Sherry – I think I mentioned in the post that I purchased them from Hop to It which is a Home Brew store. You can probably google something like that locally or order from Hop to It. Sindy – I gave four bottles away and all of the recipients were thrilled! Helen – I didn’t know you could eat it! I learn something new from you every time :) Yes, I think growth and challenge is important and that’s why you’re so good at what you do. Lynda – I am SO. JEALOUS. that you grow buddha’s hand!! If you live anywhere near here GO. They sell Buddha Hand Citron. Buddha’s Hand Citron is a New Years festivities fruit. So it’s more readily available then. It’s smells awesome and I am definitely doing the vodka but I am going to try a large jar and add red hibiscus tea flowers. I’ll let you guys know if it was an over exuberant effort at everlasting life. Addendum: re: large spiggoted jar and put the whole grizzly thing in it so it can be displayed. Jen-what kind of vodka did you use? Is cheapy really the way to go? Does the Budda’s Hand have that strong of a flavor? Shelley – cheap. I don’t even know the name. Like $10 for a giant bottle cheap. it’s incredible. seriously. just try the cheap stuff first. you won’t miss a thing. @ Andrew I love the presentation of the bottle I went to Hop to it Brewing site, but I don’t see the 8 oz bottle. Chana – I have never ordered from the site, so don’t know what they carry. You can try calling them. I’ve purchased the bottles from them before at the store.